It has been a crazy few days for the University of Washington Husky Band. On their way to Pullman, WA for the annual football game against Washington State, a bus carrying the saxophone and baritone sections flipped on it's side after the bus hit icy conditions on the road. After more than 40 members of the band were taken to area hospitals, the band made the decision to not continue to Pullman and stay together at their hotel to watch the game as a family. Two members were still in the hospital yesterday and many were still shaken up from the accident. 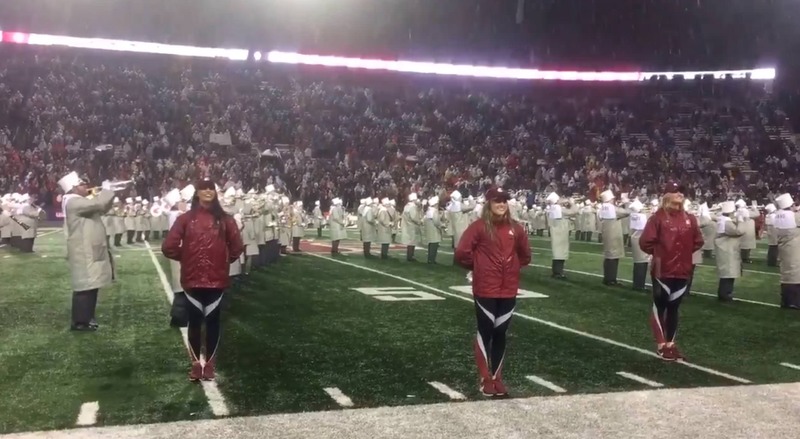 With them not continuing on to Pullman the Washington State Cougar Marching Band stepped up and promised to honor the band by playing their fight song for the UW team and fans during pregame. The WSU athletics office also agreed to not sell the band's seats to honor them as well. A very classy move by Washington State indeed. The UW football team did their part and added another performance for the Husky Band. After beating Washington State last night the Husky Band will get to travel to the Pac-12 Championship Game next week.